Posted on June 14 2017 by Candela Controls. Founder’s Hall at St. Luke’s United Methodist Church is a new worship center designed for contemporary worship services and theatre productions. What sets this facility apart from others is that the lighting system uses distributed power and control rather than a centralized dimming system. Distributed power and control, in comparison to centralized dimming system, allows for flexibility and scalability as fixtures and technologies evolve in the world of lighting. ​The lighting at Founder’s Hall is a hybrid system consisting of both incandescent and LED fixtures. Every house light is LED and has the ability to be individually controlled via DMX512. The sconces use a 0-10V signal and constant power via a DMX512 controlled Philips Captivation Module. Power to fixtures is distributed via an ETC Sensor IQ motorized breaker panel, and incandescent fixtures are dimmed via local single circuit ETC dimmers at the fixtures. LED fixtures receive their power directly from the IQ panel. Control signal originates from the ETC GIO console using sACN protocol and is then converted to DMX512 at each hanging position using ETC sACN gateways, which are powered over ethernet. 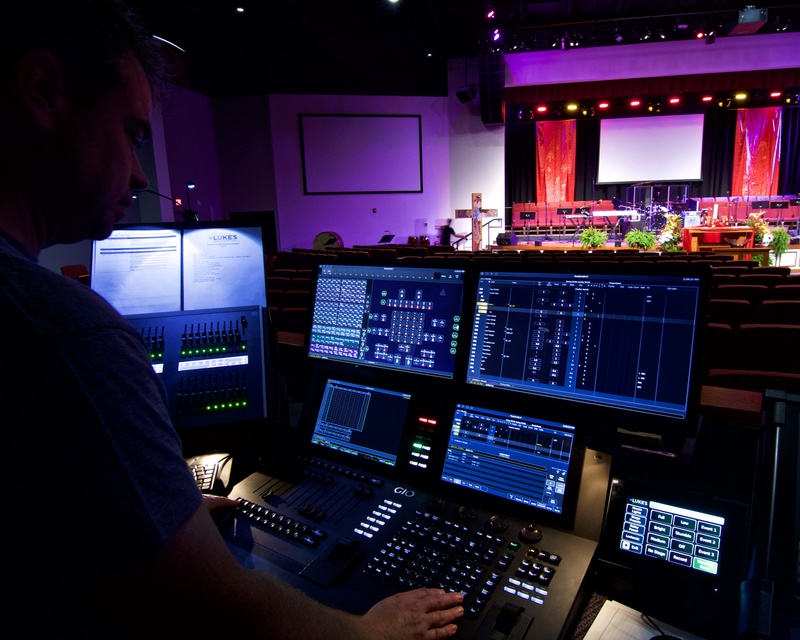 An ETC Paradigm-Architectural Control Processor provides integrated control of house lighting and basic event lighting needs for all users without the use of the GIO console. Paradigm is the core of the lighting energy management system and performs nightly sweeps to ensure circuits are not left on when not in use allowing for energy savings. Candela Controls, Inc. is proud to have provided the infrastructure installation, drapery, and system programming for Founder’s Hall.